How to treat Back Pain with Bluelight BL-FB health product? 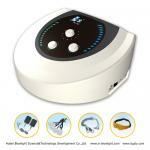 Your Position: > Knowledge >> Electro Acupuncture >>> How to treat Back Pain with Bluelight BL-FB health product? Back pain is pain felt in the back that usually originates from the nerves, muscles, bones, joints or other structures in the spine. Back pain is one of humanity's most frequent complaints. Acute low back pain (also called lumbago) is the fifth most common reason for physician visits. About nine out of ten adults experience back pain at some point in their life, and five out of ten working adults have back pain every year. By its cause: musculoskeletal (MSK), infectious, cancer, etc. Back pain is classified according to etiology in mechanical or nonspecific back pain and secondary back pain. Approximately 98% of back pain patients are diagnosed with nonspecific acute back pain which has no serious underlying pathology. However, secondary back pain which is caused by an underlying condition accounts for nearly 2% of the cases. Underlying pathology in these cases may include metastatic cancer, spinal osteomyelitis and epidural abscess which account for 1% of the patients. Also, herniated disc is the most common neurologic impairment which is associated with this condition, from which 95% of disc herniations occur at the lowest two lumbar intervertebral levels. Physical therapists, who are experts in restoring and improving motion in people’s lives, play an important role not only in treating persistent or recurrent low back pain, but also in prevention and risk reduction. Physical therapists are highly-educated, licensed health care professionals who can help patients reduce pain and improve or restore mobility – in many cases without expensive surgery or the side effects of medications. If you have experienced low back pain, you are not alone. Approximately one quarter of Americans report experiencing low back pain within the past 3 months at any given time*. Low back pain often occurs due to overuse, strain or injury. This includes too much bending, twisting, lifting, and even too much sitting. In most cases, low back pain is mild and will disappear on its own. However, for some people, back pain can return or persist, leading to a decrease in quality of life or even disability. Stay active and do as much of your normal routine as possible when you have low back pain. Bed rest for longer than a day can slow down your recovery. If your pain lasts more than a few days or gets worse, then you should schedule an appointment to see your physical therapist. Individualized assessment: Your physical therapist will ask you a number of questions about your specific condition and will thoroughly examine you for problems with posture, flexibility, strength, joint mobility, and movement. Attention will be given to how you use your body at work, home, during sports, and at leisure. Manual therapy techniques, including spinal manipulation, to improve mobility of joints and soft tissues. Now people can use Bluelight BL-FB to treat the back pain daily. Bluelight BL-FB health product can relieve the nerves, stimulate muscles, strong joints to cure the pain. There is detailed English user manual and CD in each package. Everyone can use this. This is the green treatment without any side effects.